It's our last day of the My Creative Time 57th Edition sneak peeks! Tomorrow is the day you can finally see this awesome release in its entirety and get shopping! But first, we have one last amazing stamp and die set for you to get a glimpse of today. 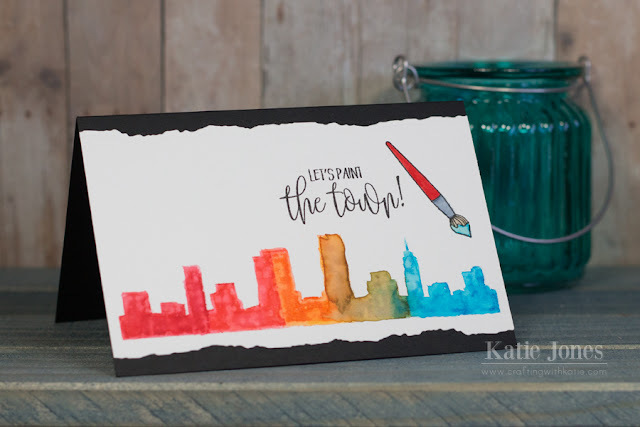 It's called Let's Paint the Town, and it includes a a variety of image stamps, 4 coordinating dies, and a handful of darling sentiments! As soon as I saw this skyline stamp I knew what I wanted to do with it! I colored right onto the stamp with my Tombow Dual Brush Pens, and then stamped onto Strathmore Bristol watercolor paper. This does not give a clear image, but then I was able to use a water brush to go over it to create my watercolor skyline. After that I stamped on the sentiment and paintbrush (also from Paint the Town), and I colored the paint brush with a combination of the Tombow pens and my Zig Clean Color Real Brush Pens. I then trimmed the top and bottom of the piece with one of the More Stitched Edges Dies before adhering it to my black card base. I love how you created the skyline with watercolor! Very pretty card! This is such a gorgeous card Katie!!! LOVE LOVE LOVE how you used the stamps!!! Oh WOW Miss Katie What a Super Beautiful Card. Love how you did your Skyline...talk about being super clever and creative. Loving your idea for coloring the stamp then stamping....the look is incredible!! I so love too how you used that torn edge die for the top and bottom the looks outstanding. You totally outdid yourself. Love...LOVE!! Darling card! Creative idea to make the town scene a watercolor piece! It looks amazing! I really love this set and your card is very pretty. Gorgeous look Katie-LOVE the water colour!!! Love how you created the water colored city scene! This looks really cool, gr8t job! Love the water colored look on the skyline stamp! Great card!!! How cool!!! I love how you made it look like you painted the skyline with the paint brush!!! SO neato!!! Love how you painted this town. I LOVE this set and your super fun creation! Super cute card. This stamp and die set is going to be fun. The black base is a perfect choice to make all of your colors pop. I love the ripped edges. Beautiful card. Fabulous effect with that awesome stamp! Love the colors! What a pretty summer skyline! Love the card size and watercolor style. Love the watercolor effect on your card. Great job! Love the watercolour effect of this card! It looks amazing! Love, love, love this new set! Wow I adore your painted skyline. Thanks for sharing. you create a beautiful watercoloring scene!! !